Click HERE to read an article on the Ganges Mast which is currently lying horizontal instead of vertical. View this video to learn more about the ‘Button Boy’ by clicking HERE. The Ganges boys in action Click HERE. Jim B remembers recently that a Chief Yeoman Reg Morris, “Belly San”, was a “Button Boy” at Ganges and still had the shilling coin he was given. It was set in a little square wooden surround and it got me wondering now whatever happened to it when he Crossed the Bar. I never went to “Ganges” during my Service, but lived in Ipswich, which is only 8 miles from Shotley. However, I did frequently go there as a Sea Cadet from 1936 until the War started. So hence I knew a bit about it. 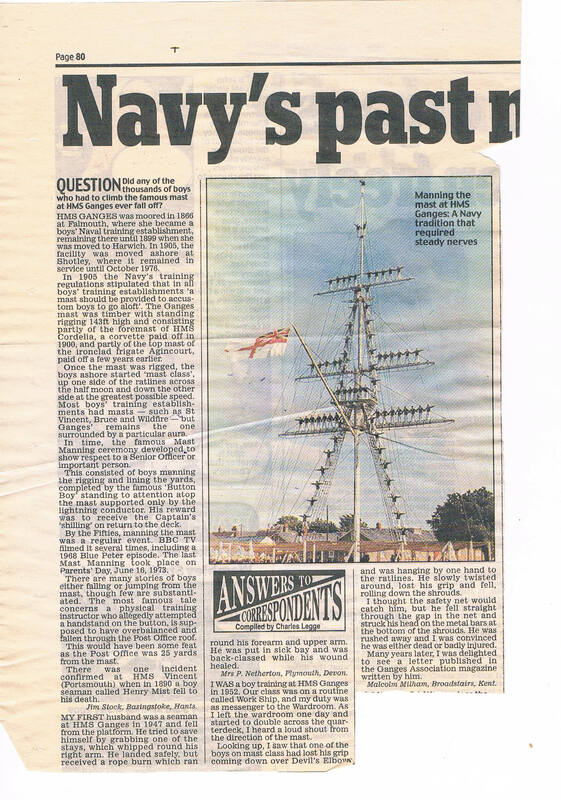 The demolition firm of J Howard Ltd, (owned by my Brother-in-Law) of Ipswich, took down the mast in the late 1970’s. I believe it was after some “argie-bargie” over it being a “National Treasure” or some such thing, that they had to re-erect it. And, later on he again took it down as by then it was deemed to be in a dangerous condition. The last time I saw it, it was laying on the ground where it had once so proudly stood. and from Dusty Miller who also had a mate who served in Ganges and is on the Ganges Assn Committee – Hi Dusty. The Mast is in a sorry state! The permission has been granted by the Council now to Develop the site. They, the Developers/Site Owners, have indicated that it will be struck down, refurbished and reinstated. Time will tell. It all looks very positive. Sadly as Jim has remarked it is indeed in a very dilapidated condition and will take some reinstating. A landmark and a memory for all those who lived close by or within the confines of Ganges. Our mess Hawke 48 was on the edge of the Parade Ground so we never really got a break from things as some of the others did. Out of the front doors and to the left was the Mast in all its glory to the right the Senior Rates mess and to the front the Parade Ground. Should I have put Port, Starboard and Van. The present Ganges Society as have those in the past is diligently working to ensure that known or well known sites such as the Mast, Laundry Hill and Faith Hope and Charity are retained and restored. Ganges turned many a boy from boyhood into a man and always striking also to see poem of Kiplings IF to the side of the stage in the Gym. Could go on forever. Drake 40 mess was right next to the mast and like all boys at Ganges the mast was always in our thoughts. Everyone had to go over the mast as high as the first platform, some struggled with that and got a rescrub until the task was accomplished. One Sunday during summer while I was there the “Authorities” deemed the weather to be good enough for the mast to be opened for boys recreation. Being 16 years old and ten foot tall and bulletproof I decided that the button was my goal. I climbed as far as the top platform and joined the short queue for the button. A short wait and there was room at the cross trees so up I went. When the guy who was on the button came down the other guy at the cross trees was having a bit of a breather and he invited me to go on up. Shinning up 15 feet of six inch steel pole is not easy even for a fit fifteen year old and I was glad when I was able to get a hold of the steel stays at he top. Next I had to haul myself up an around the button and the stays with the aid of the lightening conductor. Having accomplished this a short sit down on the button to gather my thoughts and it was time to stand up, grip the lightening conductor between my knees and chop one off. I must say that the view was just awesome. And having accomplished this feat I felt on top of the world. John Snows comments above ring loud and clear in my memory and I find it very sad that it is all being discarded.